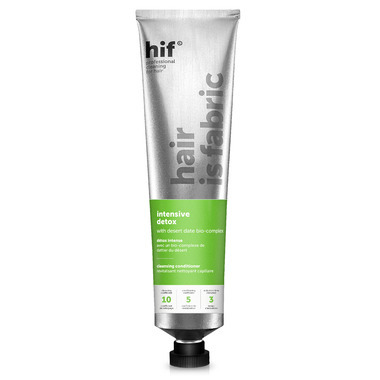 Intensive Detox provides the scalp with superior cleansing while offering a strong cooling effect. A desert date bio-complex is included that is rich in iron content, helping combat hair loss and eliminate dirt and extra residue on the scalp. Deep conditioning actives help hydrate and strengthen hair at the roots, leaving hair feeling soft and supple. Directions: Work into wet hair. Leave on for 3 minutes. Rinse. Ingredients: Aqua (Water), Sodium Lauroyl Methyl Isethionate, Parfum (Fragrance), Cocamidopropyl Betaine, Sodium Methyl Oleoyl Taurate, Guar Hydroxypropyltrimonium Chloride, Sodium Cocoyl Isethionate, Behenamidopropyl Dimethylamine, Acacia Senegal Gum, Xanthan Gum, Sodium Hyaluronate Crosspolymer, Hydrolyzed Keratin, Tremella Fuciformis Sporocarp Extract, Acacia Concinna Fruit Extract, Balanites Aegyptiaca Fruit Extract, Menthol, Cetyl Betaine, Lactic Acid, Rosmarinus Officinalis Leaf Oil, Betaine, Sodium Benzoate, Tocopheryl Acetate, Panthenol, Propanediol, Gypsophila Paniculata Root Extract, Trisodium Ethylenediamine Disuccinate, Glycerin, Lauryl Betaine, Sodium Chloride, Potassium Sorbate, Menthyl Lactate, Lecithin, Pentylene Glycol, Linoleamidopropyl PG-Dimonium Chloride Phosphate, Propylene Glycol, Ethylhexylglycerin, Carrageenan, Chlorphenesin, Phenoxyethanol, Linalool, Limonene. I love how my hair feels afterwards. My scalp feels clean and hydrated. This is the perfect cleanser for my fine, wavy hair and problematic scalp. It's gentle, but my hair feels great for days afterward and doesn't feel "unclean". It's also easy to style and requires very little extra anti-humidity product. I originally bought this to help support hair growth/reduce hair loss, I do notice that when i switch back to my other shampoo I shed a lot more in the shower. This feels really tingly on the scalp like the description says. It's a little overwhelming hence the reduction of a star.